2019 Update: Unblock-Us is no longer a stable option to access Netflix. Read on for details of the most reliable alternative to Unblock-Us. BEST VPN FOR NETFLIX:Express VPN is our #1 choice for Netflix. We’ve run in excess of 5,000 tests to see which VPNs work with Netflix. ExpressVPN is the most reliable option. If offers fast speeds and a 30 day money-back guarantee so you can try it risk free. Smart DNS provider Unblock-Us has come up with a way to bypass the Netflix proxy ban. We took advantage of their 7-day free trial to see for ourselves. Netflix users outside the US pay the same or more as those in the US, but are saddled with a relatively limited selection of shows and movies. That’s why many users resorted to VPNs and smart DNS proxies to fake their location and gain access to the American catalog of shows. While a handful of VPNs can still bypass the ban, smart DNS proxy providers were hit hardest. Once blocked, changing IP addresses to something Netflix hasn’t blocked yet is a time consuming and expensive undertaking–one that wasn’t worth the cost for most smart DNS providers. It just didn’t pay off to put up a fight, especially with the threat of another block always looming. Unblock-Us was one of the providers affected, luckily its customers can now use its service to bypass the Netflix proxy error message once again. The company hasn’t shared details on exactly how it plans to sustain the service, but it seems confident that its new measures will prevail. Comparitech tested the service and as promised, we were able to watch the US catalog of shows on Netflix as if we lived in the United States (the author currently lives in Europe). No proxy errors or other issues! Unfortunately, the update only works with web browsers like Chrome, Internet Explorer, Safari, Microsoft Edge and Firefox for now. If you want to access Netflix through a native app–such as on a game console, mobile app, smart TV, or streaming devices like Roku, Chromecast, and Apple TV–then you’re out of luck and should opt for a VPN. The reason for this is because Netflix’s native apps override a device’s DNS settings and force them to use DNS servers that give away the user’s true location. 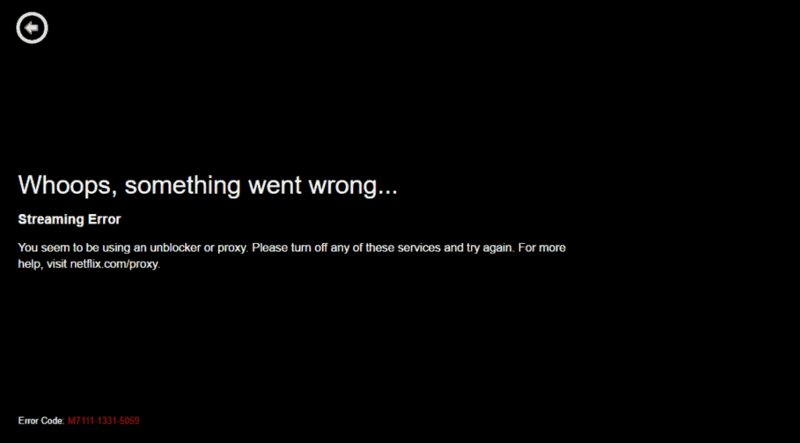 We’ll continue to test Unblock-Us with US Netflix in the coming weeks to see if it holds up. Setting up Unblock Us is fairly straightforward and doesn’t require installation of any extra software. The first step is to sign up for an account. A 7-day free trial is available without the need for a credit card. Once that’s done, you can find setup instructions for Windows PC and Mac OSX. For major desktop operating systems, an “Easy Setup App” is available for download from the Unblock-Us site. This functions as a system tray icon that turns green when it’s working. The best part is that the app monitors your IP address for changes and updates Unblock-Us’ systems accordingly. Changing your DNS addresses every time you reconnect to a wifi network is a pain, so this is pretty handy. If the Easy Setup App isn’t available for your device, you’ll have to input the DNS addresses manually. This process varies on your operating system, so consult the tutorials on the Unblock-Us website.